I recently took a trip to the Trafford Centre for some much needed retail therapy. I did my best to refrain from getting a little too spendy, and only made a couple of stops for some new beauty buys; one was at the MAC counter in Selfridges, the other was Superdrug. I took a bag of empties with me so I could get my hands on a new MAC lipstick, and by the way, I am so pleased they’re still offering this! I’m glad I gave my bedroom at home a good clear out this summer as I found so many empty foundation bottles I had been collecting over the years. I hadn’t given much thought to which lipstick I fancied, and as I glanced over the colours I was a bit unsure. After thinking about what I already had in my MAC lipstick collection (read my old post here) I thought it would make sense to add a classic red to it. You can never go wrong with a classic red, right? So I whittled it down to two shades; Russian Red and Ruby Woo. 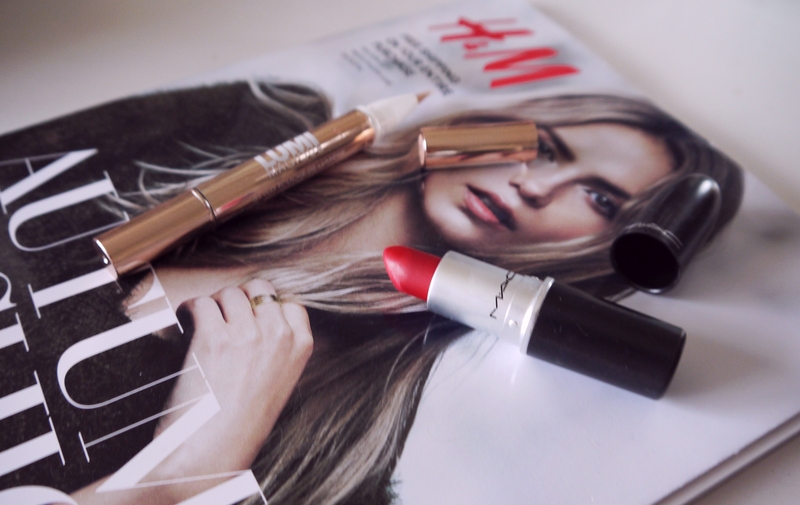 I was swayed towards Ruby Woo as I knew it was very matte; my favourite finish in a lipstick. Not only that, it was a slightly deeper red, which meant it would be the perfect shade for the upcoming seasons. The colour itself is unbelievably pigmented, and holds so well throughout its wear. Even the old glass trick won and I’ve been wearing it proudly. 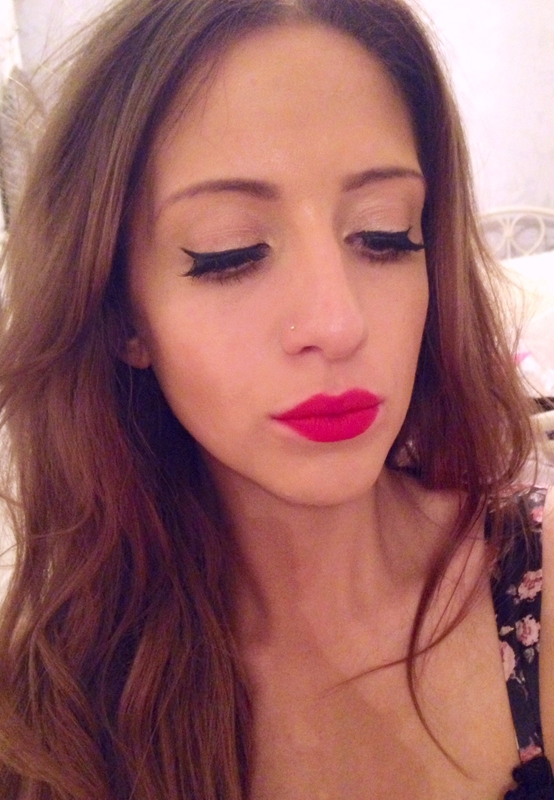 A good lip liner also works well to give the look of fuller lips; Ruby Woo is a great choice for the perfect pout! After getting the lipstick I headed over to Superdrug to get my eyebrows threaded, as well as having a browse round the aisles (of course). L’Oreal was offering a buy one get one half price offer, and I needed to pick up some L’Oreal True Match Foundation anyway so I thought I’d give the Lumi Magique Concealer a try. I loved using the foundation this summer and wanted to keep the dewy glow in my base while going back to a fuller coverage foundation. I knew from reviews I had read that this product is more of a highlighter than a concealer, so I wasn’t expecting high coverage. 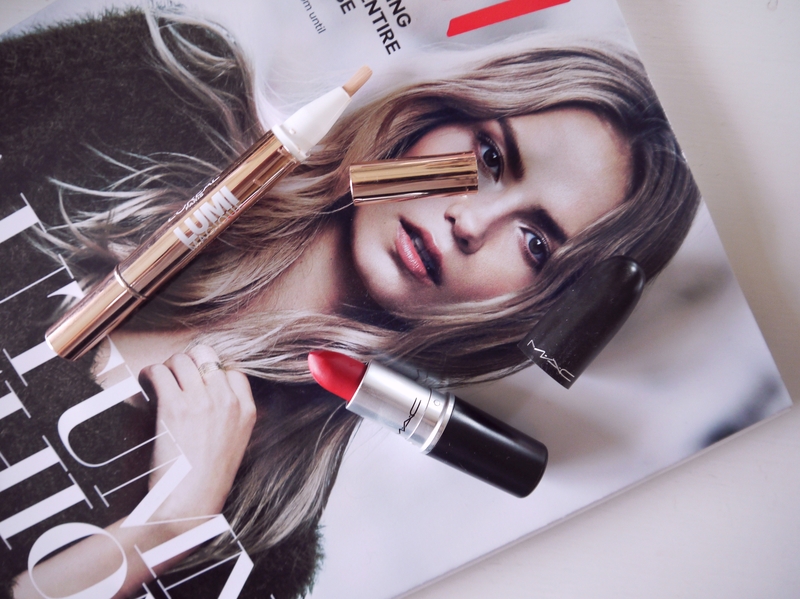 It’s supposedly the budget version of YSL’s Touche Eclat Pen, and it definitely offers the same concept; a twisty bottom fills the brush at the other end with product, allowing you to sweep it in the area you want. I apply this underneath my eyes, down the centre of my nose and on my cupids bow for a brightening effect. As I mentioned before this isn’t high coverage, therfore I’ll apply it over the top of my Collection Lasting Perfection Concealer. I stay away from applying it on any blemishes too… glowy spots are not a good look! Overall I love this product as a liquid highlighter; it offers a different effect than my favourite liquid highlight, Benefit’s High Beam, as I could never imagine applying High Beam all over my dark under eye circles; it would look far too much! Lumi Magique offers a subtle, blendable highlight that still offers coverage like a concealer. The packaging is also a bonus; the rose gold tube looks much more expensive than £8.49. So these were my new beauty buys! Do you own either of these products? Hello Sarah, actually I haven’t got these ones in my collection, but I bought a Mac red lipstick some time ago and it’s the shade #ginger, a more orange-coral kind of red…and talking about concealers, I’m so in love with the Mac Pro Longwear concealer, which is actually one of the best I ever tried. I’ll give a look at both your new beauty buys. cheers! I love Mac’s Ruby Woo, it is such a gorgeous lipstick. Hello my dear blogger, I just nominated you for the “One Lovely Blog” award.